This post was sponsored by Keter®, which provided me with garden planters in exchange for my honest review. It’s also sponsored in part by Cave Tools, which gave me a BBQ Grill Brush in exchange for my honest review. 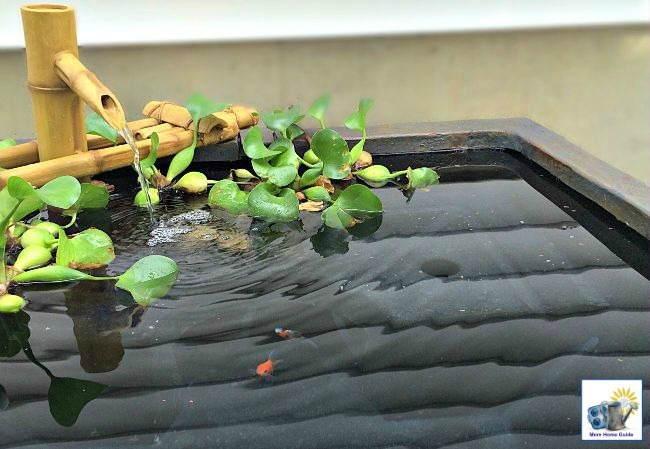 The patio pond and bamboo fountain that I mention in this post was given to me by Aquascape. I was provided a canvas photo pillow from CanvasChamp in exchange for my review. This post contains Amazon affiliate links for your shopping convenience. I may receive a small commission that helps fund this blog if you click on an Amazon link. Thanks! Happy Friday, everyone! This weekend is promising to be a very rainy one where I live, but hopefully my family and I can stay out of the rain and have some fun together! 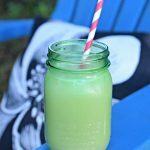 Today I’m sharing a Friday five post — where I share five tidbits about what I’ve been up to lately! 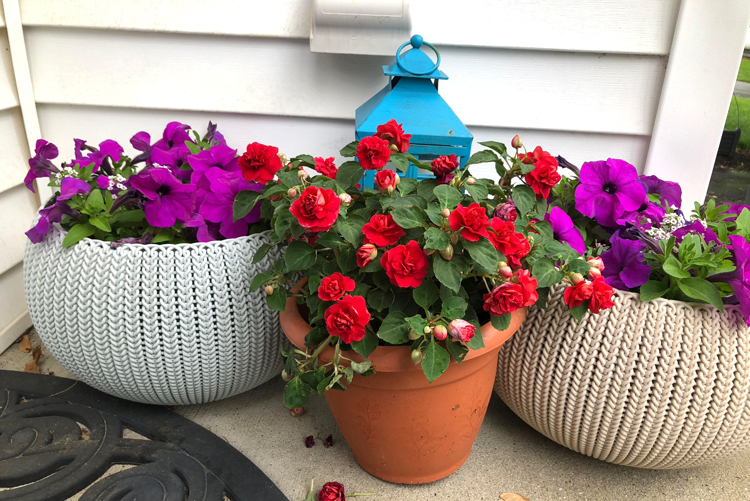 A few weeks ago I planted petunia and alyssum flowers in some beautiful Keter® containers . 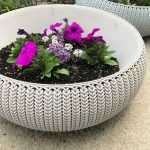 The planters have an attractive low-maintenance knit texture, and removable liners and drainage plugs that make gardening easier. I’m happy to report that the flowers have been growing wonderfully in my new planters. 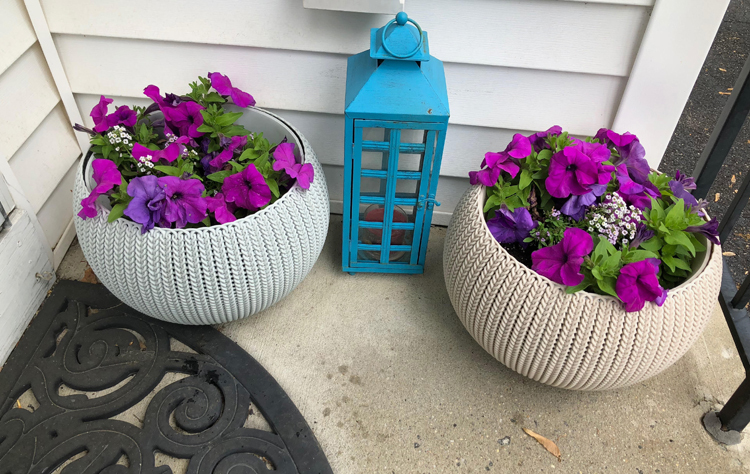 Whenever I see the container gardens on my front porch and on the walkway leading to my house, I smile! On Mother’s Day, my family got together with some good friends to celebrate the holiday. We’ve been getting together the past few years to celebrate our Mother’s Days together, and it’s become such a nice tradition! I’m happy that I can share the holiday with my good friend, Lela, her family, and our husbands and kids. Our husbands were good friends in college, and now I count Lela as one of my best friends! I’ve come to regard her family as my family, so I look forward to our get-togethers. A real plus this year was that my family got to bring our new puppy, Mochi! The guys prepared our holiday meal, and Mochi was on good behavior. (The only times he wasn’t perfectly behaved was during our 1-hour car rides there and back. But he was still pretty good.) 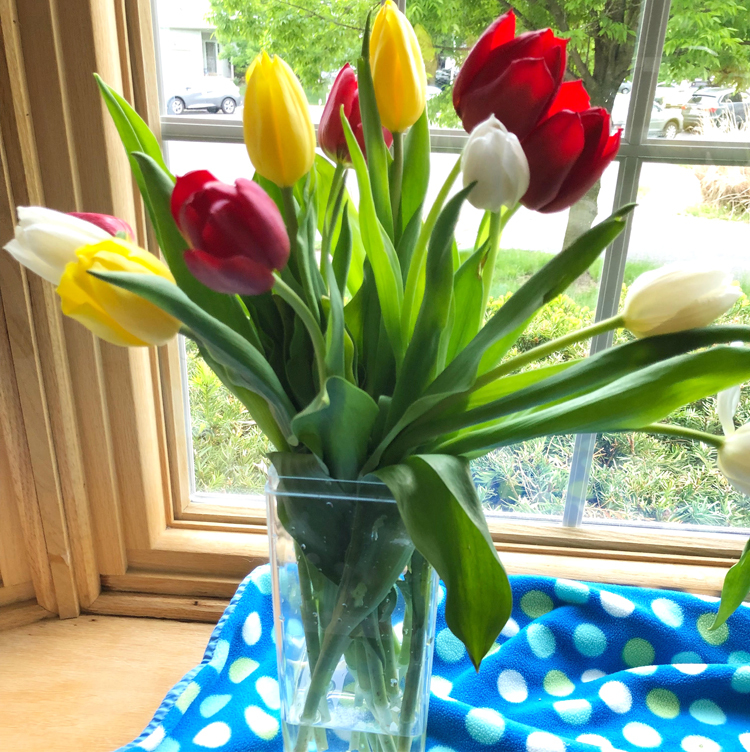 For Mother’s Day, my husband surprised me with three bouquets of tulips and two DVDs that I had been wanting. Lela also gave me some flowers, which I added to the blooms on my front porch. I’m looking forward to doing some grilling on the patio soon! The past few weeks, I’ve been getting my family’s grill ready for the season. 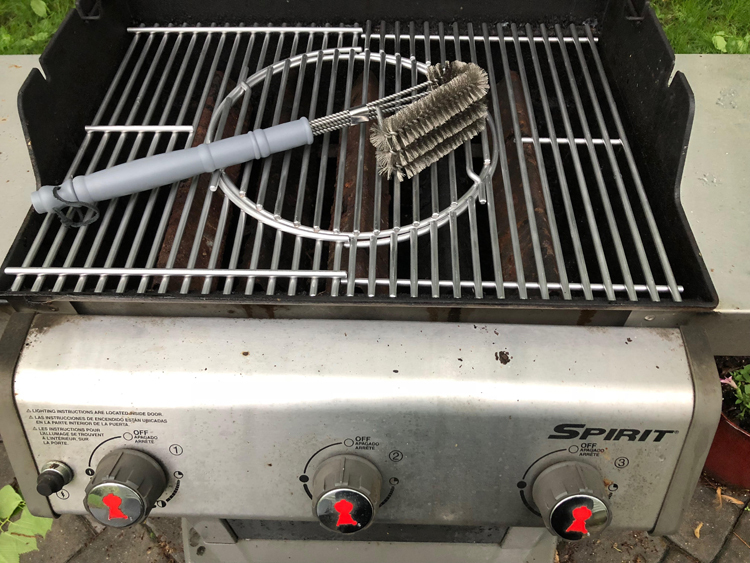 I recently got new stainless steel grates for the grill (the ones that came with the grill had rusted) and I just got a BBQ Grill Brush from Cave Tools. (Now that I have new grates, I want to keep them clean.) The Cave Tools BBQ Grill Brush has a 100% rust-proof design with stainless steel bristles for superior cleaning strength. (Which I’m glad about because of my previous experience with rust.) I love the extra-long handle on the brush. 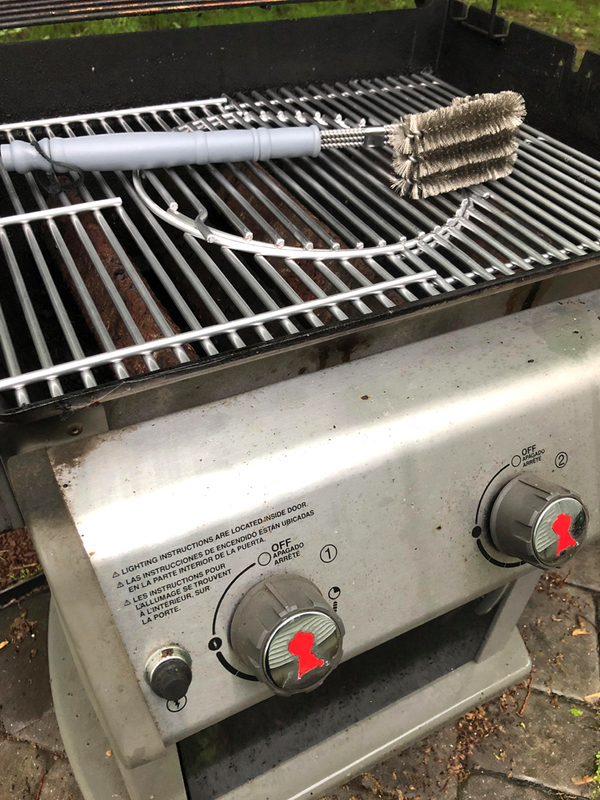 I always clean the grill while it’s still warm, so the long handle will prevent me from burning my hands. The brush also comes with 25 delicious grill recipes that I’m looking forward to trying. If you would like a Cave Tools BBQ Brush tool, I have good news! 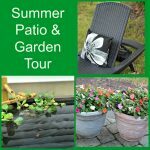 Cave Tools is offering Mom Home Guide’s readers 15% off on the BBQ Grill Brush at CaveTools.com with the coupon code, BBQBRUSH15. 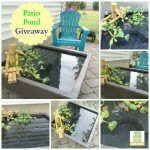 Three years ago, I received a gorgeous patio pond from Aquascape, a provider of pond supplies. The pond has become my family’s favorite part about our yard in the summer. We move our goldfish to the pond in the summer and fill the pond with beautiful flowering plants. My daughters and I like to have our morning coffee and tea out by the pond. Sadly, last fall when I emptied the patio pond for the winter, I accidentally broke the Adjustable Pouring Bamboo Fountain that Aquascape gave me for the pond. I was quite upset! When I told Aquascape about the accident, they kindly provided me with a new one! This weekend promises to be a washout, but once the rain subsides, I hope to get the patio pond up and running for the season. Thanks, Aquascape! I recently received a custom canvas photo pillow from CanvasChamp. 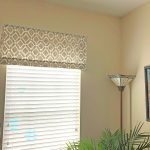 CanvasChamp is a site where you can create custom canvas prints, pillows and other products using one of your photos or an image from their collection. My pillow arrived a few days ago, and I love it! 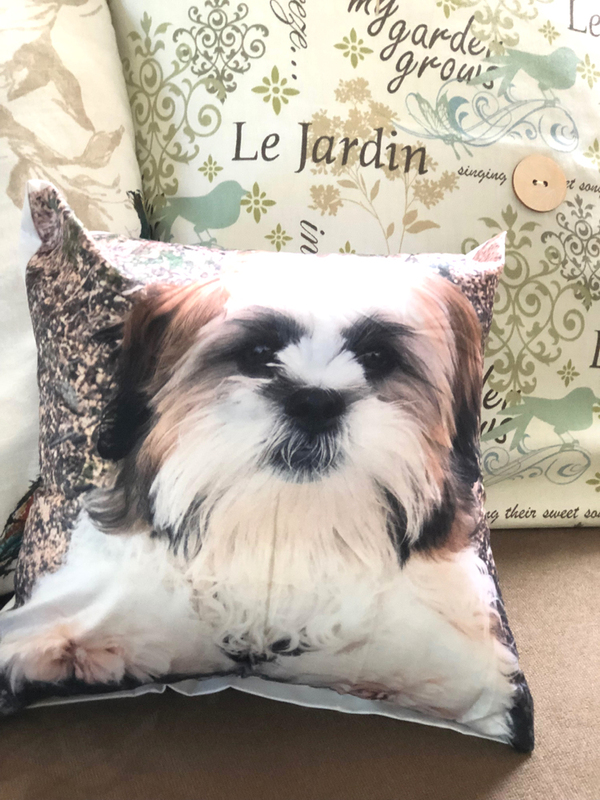 I used a print I took of my family’s new puppy, Mochi, for the pillow. The pillow now sits on my home’s living room sofa among my collection of throw pillows. I think the new Mochi pillow looks great on the sofa! 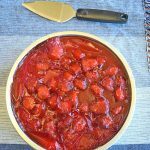 Lots of great things in this post. Your flowers are just blooming away in those gorgeous pots. I’m excited to get my raised planter this week. Your grill looks great! I need to check to see if ours needs more gas, I need to start putting Brian to work on grilling some great BBQ’ed dinners!